Recorded while Antonioli was living in Europe, Foreign Affair features a bracing blend of post-bop jazz and Balkan music created with players from Serbia, Albania, Germany, and the United States. Antonioli’s dark voice blends in sensuous interplay, creating a genre all her own. 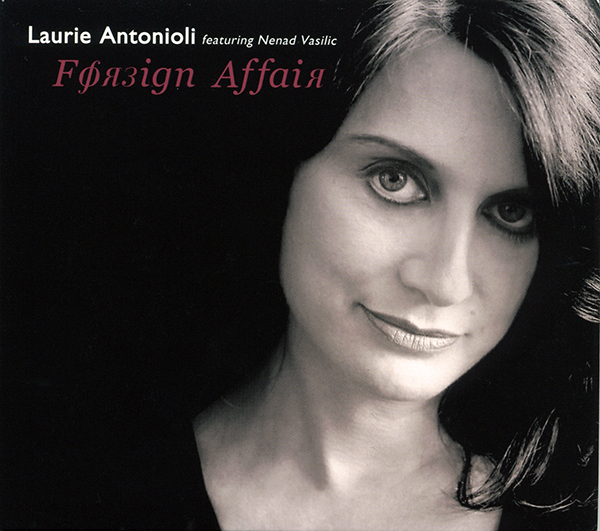 Beneath its title’s semi-noir implications of romantic intrigue, Laurie Antonioli’s Foreign Affair speaks of a universal human yearning for the obliteration of the very borders we put up between each other. Musically, at least, the seeds of that yearning were planted in Antonioli at an early age. While growing up in the San Francisco Bay Area, she heard the Yugoslav language and music of her father’s ancestry, in which the Antonioli names goes back some 500 years in Montenegro. In addition she inherited her maternal grandmother’s passion for jazz through the recordings of Louis Armstrong and Nellie Lutcher. Through high school and college she found herself leaning backward, forward, and sideways in the music of Billie Holiday, Joni Mitchell, John Coltrane, the Bulgarian Women’s Choir, Eric Dolphy, Jackie & Roy, Lakshmi Shankar and Neil Young. So Antonioli’s jazz path was never entirely straight ahead. Her professional mentors and peers in San Francisco included vocalists Mark Murphy and Bobby McFerrin, saxophonists Pony Poindexter and Joe Henderson, and pianists George Cables and Joe Bonner. Antonioli made a recording debut in duo with Cables on 1985’s Soul Eyes (Catero Records) and was the featured guest on Bonner’s 1987 New Beginnings (Theresa Records, reissued in 2004 on Evidence). She established herself as a unique and beguiling voice in a new wave of jazz vocalists, but driven to reweave some of the loose ends in her personal life and commit herself to raising her daughter, Antonioli withdrew from the scene for much of the late 1980’s and 90’s. She started teaching jazz singing privately while in Munich in the ‘80s, and upon returning to the US continued her teaching career leading vocal workshops, teaching privately from her home and as a guest instructor in college jazz programs around the Bay Area. In 2000 she joined the faculty of The Jazz School in Berkeley, California. Antonioli’s welcome return to recording has everything to do with her recent move to Europe and her current post as Professor in the Vocal Jazz Department at KUG University in Graz, Austria, a major hub through which hundreds of musicians pass. (Mark Murphy, Sheila Jordan, Andy Bey, Tom Lellis and Jay Clayton have all taught at KUG.) After six months or so of scouting the musical landscape in Graz, Antonioli put together the multicultural band that recorded Foreign Affair. Serbian musician Nenad Vasilic became the anchor, his upright bass and astute composing skills dovetailing with Antonioli’s warm, elastic vocals and her original song and lyric writing and ingenious adaptations. Albanian guitarist Armend Xhaferi and New York drummer/percussionist/composer John Hollenbeck completed the quartet, and Antonioli brought in German saxophonist Johannes Enders after working with him on a tour of birthday celebration concerts for pianist Fritz Pauer, her close songwriting and performing partner. Only a handful of musicians – bassist George Mraz and pianist Larry Vuckovich come to mind – have successfully melded Eastern European and Balkan influences into jazz. 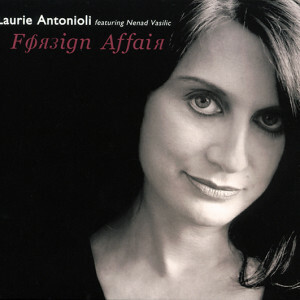 With Foreign Affair, Antonioli – who has written original lyrics to music by Miles Davis, Wayne Shorter, John Coltrane, Lee Morgan, Richie Beirach, Fritz Pauer and Joe Henderson – sets a new standard. From the interpersonal intimacy of “I Know You” and “Mayana” through the longing for freedom and peace implicit in “Crni Narcis” and “Music Box”, she not only creates a cultural continuity but also illuminates the way yearning can be resolved through the recognition that each moment is an opportunity for arrival. Indeed, throughout Foreign Affair, Antonioli redefines “home” as that place in the fearless present where the past is embraced and the future is a panorama of unfettered possibilities. Be the first to review “Foreign Affair” Click here to cancel reply.